Meeting the Archive is the culmination of the practice component of the artists PhD including new and existing work that investigates how artists are able to draw attention to the instability and heterogeneity of archives. The exhibition is made up of a series of moving image works created through seeking and responding to instructive footage held in collections within institutions. Taking a performative, semi-autobiographical approach, the artist seeks to find and create relationships between himself and the found films. The work takes a playful approach to watching bodies ‘perform’ and then uses re-enactment strategies to interpret and physically explore new ways of understanding the archive. Within this, Paige’s ongoing interests in personal betterment, instruction-led activity, humour and his lived experiences are played out. 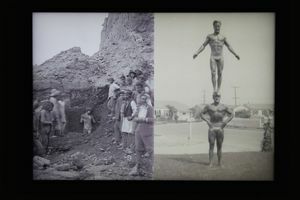 Footage used in the work has been taken from the online Prelinger Archive, the Macdonald Collection, Library of Congress, USA, and intersected with the returns from online searches. Key terms including, ‘learning’, ‘sport’, ‘leisure’, ‘training’ and ‘education’ were used to discover films that encourage viewers to watch and learn.